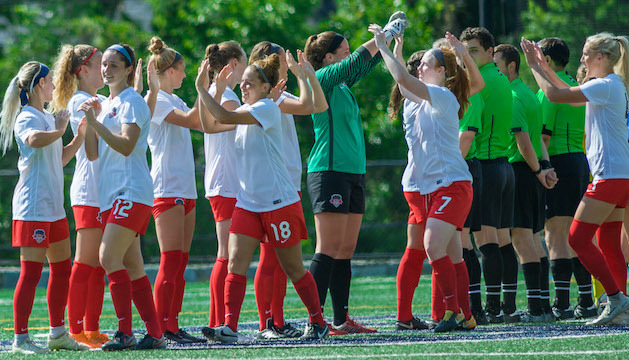 Boyds, MD (June 18, 2018) – The Washington Spirit Reserves have opened the 2018 Women’s Premier Soccer League (WPSL) season on a four-game unbeaten streak, earning two wins and two draws while holding a share of first place in the Colonial Conference. Coaches KJ Spisak and JP Sousa have led the squad to within two games of finishing the regular season undefeated for a third straight year. After capturing the 2015 USL W-League title in the league’s final season of play, the Spirit Reserves joined the WPSL in 2016 and to date have compiled an undefeated regular season record of 16-0-6. So far this season, the Spirit Reserves have shut out three of their first four opponents while outscoring the competition by a margin of 10-2. The team opened the season on June 3, playing Virginia Beach City FC to a 2-2 draw on the road. Butler University’s Maeve Burger led the Spirit Reserves with a hand in both goals, scoring one in the 12th minute and assisting Kristin Schnurr on the other in the 15th minute. Burger’s goal was set up by University of Virginia midfielder Ayan Adu. On the defensive side, goalkeeper Jessica Berlin came through in the 82nd minute with a penalty kick save to preserve the 2-2 scoreline. On June 7, the Spirit Reserves overpowered Old Dominion Cesena USA in a 6-0 rout at Freedom High School. The game was highlighted by braces from Adu and University of North Carolina standout Bridgette Andrzejewski, as well as 2 assists each by Schnurr and Georgetown’s Meaghan Nally. Burger and Marissa Sullivan added one goal each, and Brenna Connell notched her first assist of the season. Washington picked up another point on June 9 in a scoreless draw on the road against Legacy W76, as Berlin and the back line combined for another shutout. They continued their defensive dominance in their most recent outing on Saturday, June 16 in a 2-0 home win over Virginia Beach City FC at Stone Ridge School. Sullivan netted her second goal of the season on an assist from Chiny Asher, and Carson Nizialek struck her first goal of 2018 while Berlin and the defense extended their shutout streak to three. The Spirit Reserves will aim to complete their third consecutive undefeated regular season over the next weeks, with home matches against Legacy W76 (June 24) and Old Dominion Cesena USA (June 30). Both matches will be played at Stone Ridge School.